Oven-Baked Doughnuts with Chocolate Glaze, rich, decadent, with an incredibly fluffy texture, and a lot healthier than the fried version. These doughnuts are heaven! If you think of doughnuts as being one of the most unhealthy, sugar loaded, deep-fried calorie bombs, you are probably not too far from the truth. 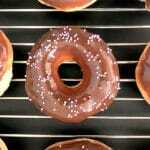 But, there is a better, and less naughty way of making doughnuts. And guess what, they taste as good in the oven as if you would deep fry them. It doesn’t take that much longer either, they only needa about 15 minute in the oven. And no doughnut pan needed. Yes, there is the double proving, just so you can get some nice fluffy doughnuts, but if you get on with something else, you won’t even notice how time flies by and you dough is nice and risen. 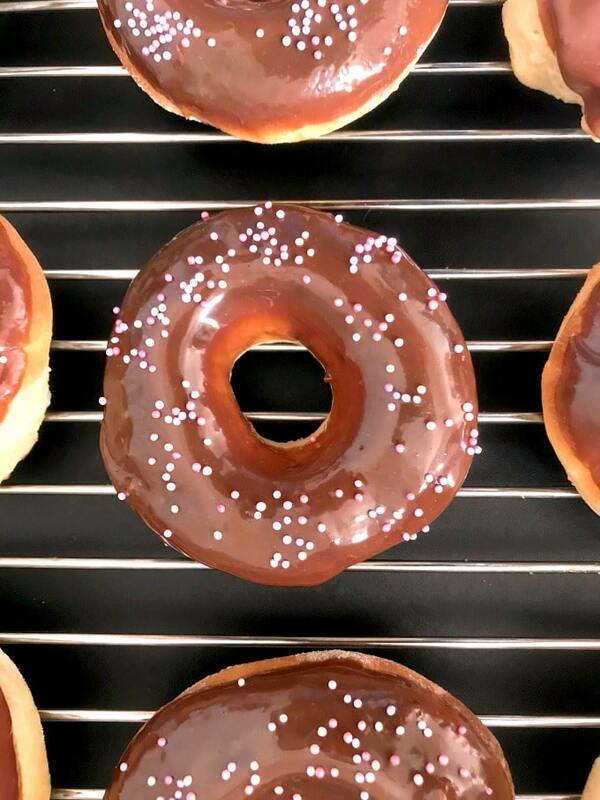 The secret to always baking perfect doughnuts is letting them proof in a warm place, so that the dough can double in size, otherwise the doughnuts will be flat in the end. And do prepare yourself for some good kneading. 5 minutes at least, no cheating, please. But then, when you get to have a bite of these super duper doughnuts, you will congratulate yourself on the great job you have done. As for the glaze, a good old chocolate glaze gives the doughnuts that heavenly finishing touch, making them even more indugent. But, you can choose anything else you like, salted caramel sauce or white chocolate glaze. Now, let’s talk about yeast. It happened way too often that the yeast was no longer active, and I could not use it in baking. I find that the best one to buy is the active fast-action dried yeast that can be specially used for kneading by hand, rather than a kitcehn aid or a bread machine. That is case you do choose to knead by hand. It works every single time, and the dough rises nicely in just about one hour. However, be advised that how quickly the dough rises also depends on how warm the room is. The warmer, the better. 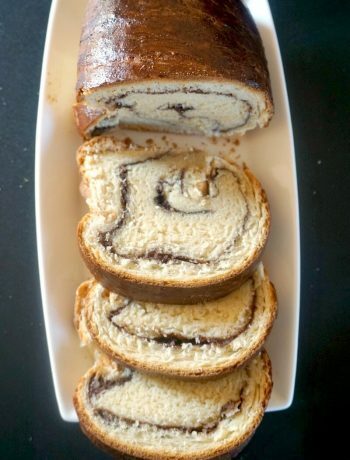 I usually cover the bowl where the dough rests with clingfilm, then wrap it around with a ktichen towel. Better keep it as warm as possible. But, if you need to pop out, for example, and you are back after a couple of hours or so, that’s not a problem at all. I usually the dough magically rise while I take the girls to play outside, and bake once I am back. Or, if we are home, I carry on with cooking lunch, and bake when I finish. 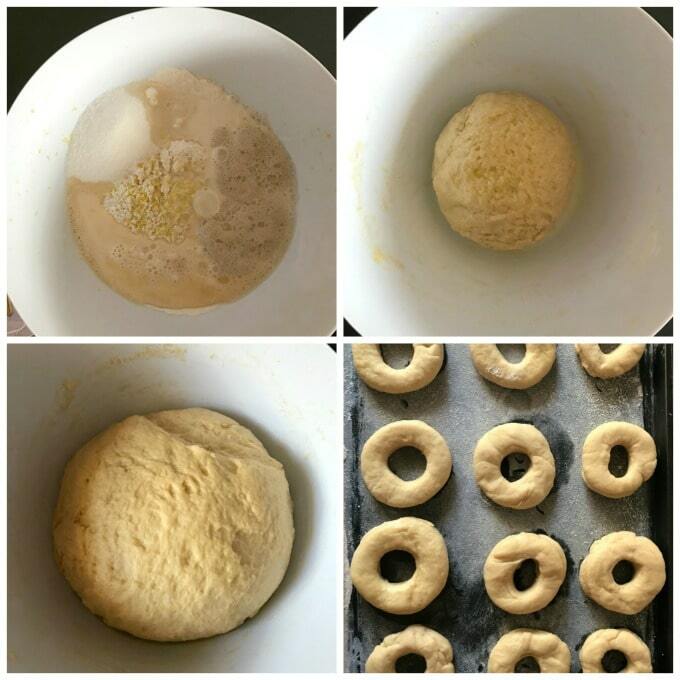 Do give these yummy baked doughnuts a try, you will fall in love with them. What a treat! 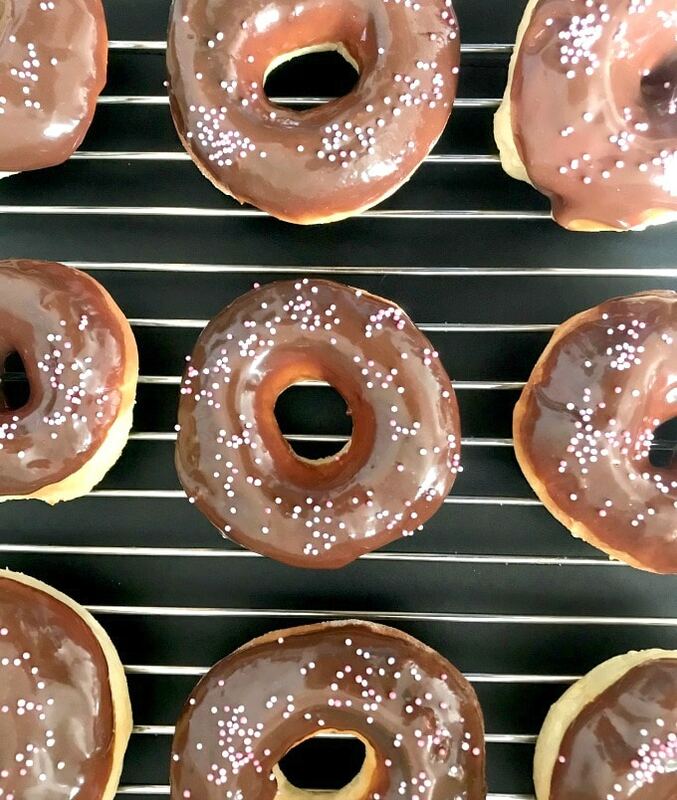 If you’ve tried my OVEN-BAKED DOUGHNUTS WITH CHOCOLATE GLAZE or any other recipe on the blog then don’t forget to rate the recipe and let me know how you got on in the comments below, I love hearing from you! You can also FOLLOW ME on FACEBOOK, and PINTEREST to see more delicious food and what I’m getting up to. Oven-Baked Doughnuts with Chocolate Glaze, rich, decadent, with an incredibly fluffy texture, and a lot healthier than the fried version. These doughnuts are haven! Warm up the milk and pour it in a jug. Add the yeast and a teaspoon of sugar, and set aside for at least 10 minutes so that the yeast can become foamy and rise. In a large bowl, add the flour, the rest of the sugar, zest of one lemon, egg and butter. The butter and egg should be at room temperature. Now pour over the milk and mix everything well with your hands. Transfer the dough to the working surface and knead it for at least 5 minutes, it will become elastic. Use a bit more flour if it's too sticky. Oil the bowl and place the dough in it, oiling it lightly as well. Cover with cling film and wrap the bowl with a clean tea towel. Leave it to proof for at least 1 hour, so that it can double its size. 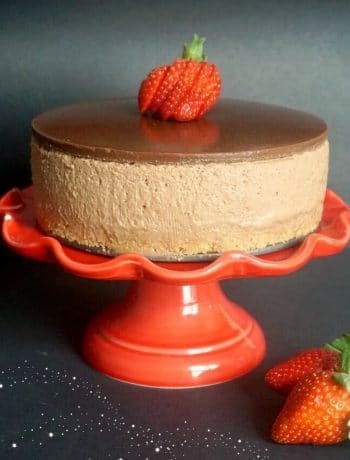 To make the chocolate glaze, bring the cream to a boil, then add the chocolate broken into pieces, give it a good stir, so that the chocolat can melt, then take it off the heat. When the dough is double its initial size, transfer it to the working surface again. Use a rolling pin to flatten it and cut round circles, and a smaller cirles in the middle, cookie cutters will be good, otherwise a glass and a plastic bottle lid can work too. Place the dough rounds on the baking tray and again leave to proof for about 1 hour. Bake the doughnuts for about 10-15 minutes, keeping an eye on them so that they don't burn. Leave to cool, then dip them into the chocolate sauce to coat the top. You can adds some sprinkles too if you like. Thank you, Lynn! They are really nice, even nicer than the fried ones. I just love donuts! These look so soft an pillowy (I think that’s a word?) And salted caramel? Yum! I love doughnuts! This salted caramel version of your’s is just too good!